"This is a great hot dip and it is extremely simple. It can be easily cut in half for an at-home snack. Enjoy!!!" Preheat oven to 350 degrees F (175 degrees C). Prepare a 2 quart baking dish with cooking spray. In a large mixing bowl, combine the mayonnaise, onions and cheese. Pour the mixture into the baking dish and bake for approximately 45 minutes, until the top is slightly brown. Serve hot with buttery, round crackers. 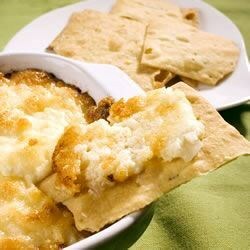 Make every day a game day with Chef John's amazing potato chip dip! This is simply the best dip I've ever made. I've had rave reviews from everyone who has tried it.